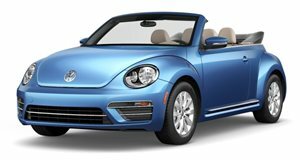 Drop-top VW gets the R-Line treatment for North American customers, too. Previously confined largely to the European market, Volkswagen has been bringing its R-Line models over to the US. The sportier appearance has already made its Stateside on the likes of the Tiguan, Touareg, CC and hardtop Beetle, and at the auto show currently under way in Chicago, introduced a similar treatment on the Beetle Convertible. Equipped with the 200-horsepower turbo four, the R-Line model includes unique 19-inch alloys with low-profile rubber and bi-xenon headlamps with LED daytime running lights. Peering inside, you&apos;ll find leather upholstery, a flat-bottomed sport steering wheel, aluminum pedals and metallic dashboard trim as well as a Fender audio system. Special badging inside and out further set it apart from more ordinary drop-top bugs. Volkswagen only released one photo of the US-spec R-Line cabrio, but we&apos;ve included a few of the European model as well for illustrative purposes. For one, its drivers probably have better lives than most people.